I swatched out 13 more Wet n Wild Megalast Lipsticks here. Today is 917B - Cinnamon Spice! This color turns berry-red on me. It immediately made it to my small collection of "my lips but better", because it pulls one of my favorite lip undertones out. 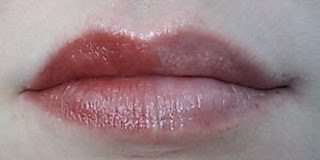 When I applied this color without putting on balm first, the color was much deeper. I prefer it over a balm, sheered out a little. The blue tones even made my teeth look whiter! I really love this shade. Now for what I would call full strength. I applied directly from the tube. Keep in mind that this is a matte formula, but it does go on creamy. If you put some lip balm on your lips before applying it, the formula will remain a satin finish. If you apply the lipstick without any balm, the finish will look matte, but will feel satin on your lips. This color does intensify with a second coat. Next is full lip. I applied directly from the tube to the bare side, and I put on about 2 coats. This lipstick is very opaque when applied directly from the tube. So any votes on liking a closed mouth photo vs a smile?